The power-up system feels truncated, like an idea that wasn't followed through. It adds nothing beyond a question: what else could the game have had, but didn't? It’s one thing to support an old genre; it’s another to support old console hardware. But Ghost Blade HD has its roots on the Sega Dreamcast with a game from only two years ago, released by developer Hucast fourteen years after the system was discontinued. Now it’s made the jump from sixth-generation console to the eighth, still representing an old genre but needing to justify itself to a less specialist marketplace. 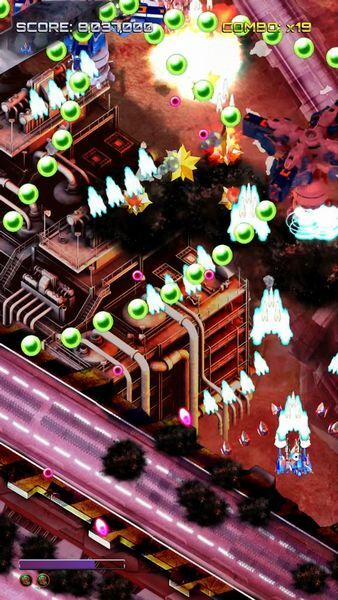 If you distilled the traditional scrolling shoot-em-up into its purest essence, you would probably end up with something not unlike Ghost Blade HD – your ship firing up the screen as it scrolls, with various sizes of enemy spacecraft, tank, ship and gun turret all filling the screen with firepower. 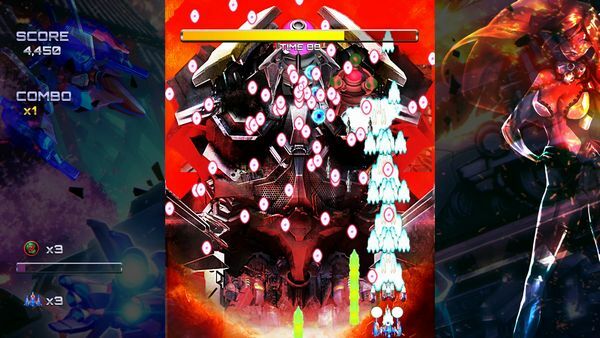 And it’s worth pointing out that it’s about filling the screen as much as firing at you, as the game fits into the shmup sub-genre of bullet hell, where precise flying, fire pattern recognition, and general awareness while the screen tries to confuse you with flashes of colour and explosions are all essential skills. You initially pick from one of three ships, each with a different basic firing pattern (although all three share a focused firing mode if you want to put extra damage into something ahead of you), one of three difficulties, and then head into five levels of blasting through pretty much everything that moves and many things that don’t. If five levels doesn’t sound like much… well, it isn’t – if you manage to complete the game, that run will take you about twenty minutes, although the difficulty is stacked against you doing that in the first few goes as you learn what your ship can do. It’s very definitely carrying the feel of a late 90s arcade game, with three lives per credit and three credits to continue if you get blown to pieces; and like playing a game in an arcade, you’re there for a short burst of gameplay rather than hours of prolonged exploration. I’m split on whether this is something to be commended or criticised – certainly, the game feels short, though the levels that are there are well designed and still fun to replay. Beyond the core game, there is also a training mode, where you can choose a level or a boss to practice against, and a score attack mode – one of the game elements that has a big advantage over the original version, thanks to online leaderboards letting you see how you stand worldwide. There are various game elements that do need to be praised or condemned individually though. The game’s presentation is broadly pretty good – the soundtrack fits the game very well, and visually it is sharp and colourful, which is essential for quickly spotting a slim route between bullets to slide the ship through. Perhaps most importantly, the hitbox feels accurate – those narrow gaps between shots to fit through… sometimes I made it, sometimes I didn’t, but it never felt like the game was taking it too easy on me or landing a shot that I’d really avoided. It’s trying to set a challenge, but it’s not trying to be unfair. However, there is something about the game’s size that feels underwhelming. This isn’t a criticism of its length so much as its scope, as for everything that it does well for the genre, it’s hard to think of anything that it does that is new. Often bullet hell games are marked by mechanics for dealing with the swarms of ammo on screen; here, you can fire one of your smart bombs that will clear everything out, and… well, that’s it. It’s pretty straightforward. If you fancy rotating your screen, the options menu lets the game take advantage of this, and make better use of the layout. Other display options include darkening explosions and reducing the brightness of the background, if you find them distracting from the action. The game also starts with you collecting power ups, adding little drones to your ship and increasing your fire output. However, the upgrades for each ship are a linear progression – you’ll never find alternate weapons, or keep upgrading as much as you can. Instead, you’ll get several tokens and be fully upgraded within a minute of starting, and this is your ship for the rest of the game; even if you die, this firepower stays. The upgrading stands out as something unnecessary, and leaves me wondering if it was a game mechanic added with ideas of becoming something more. Instead it comes across merely as something that could have been. It’s hard to pin down the best description of playing Ghost Blade HD, though the term “satisfyingly average” probably covers it both positively and negatively. 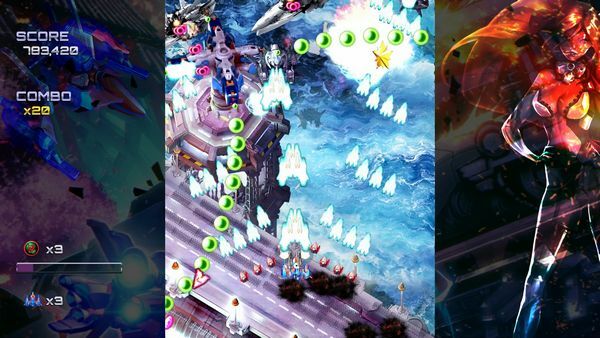 The game is fun, and if you like traditional shoot-em-ups it’s a good one to play – it combines the colours, sound and gameplay you’d think was out of a 90s arcade game, and provides some good sessions if you’re after something short and sweet. But equally, it feels like it plays things very safe – perhaps too safe – by adding nothing new to the genre. It’s a fun blast, a pure shooter experience perhaps, but offers little more than that if you want something to grip you in the longer term.